Harsh ascents, craggy summits and fine lines through fresh, deep snow. This makes the ASCENT 22 AVABAG the perfect companion for demanding tours in the depths of winter. ASCENT means total emphasis on function and safety while being light and extremely comfortable to wear. That’s why we discarded all unnecessary features when designing our extremely light avalanche backpack. We concentrate on what is essential. One reason for the low weight of the ASCENT 22 AVABAG is the use of extremely light but abrasion-resistant materials such as 100D Robic Ripstop nylon. But this airbag backpack is not only light – it also provides a high level of wear comfort. The foam moulded 3D back system distributes the weight evenly between the hip fins and the lightly padded shoulder straps. Features such as a circular frontal zipper that provides quick access to your equipment, as well as a diagonal ski attachment, an ice axe holder and a rope fastening, make the backpack what it is: a technical, ultra-lightweight avalanche backpack for challenging ski tours. *Weight fluctuations of +/- 4% may arise during manufacturing. In addition, our AVABAG unit can be easily and quickly installed into our ASCENT 22 AVABAG. 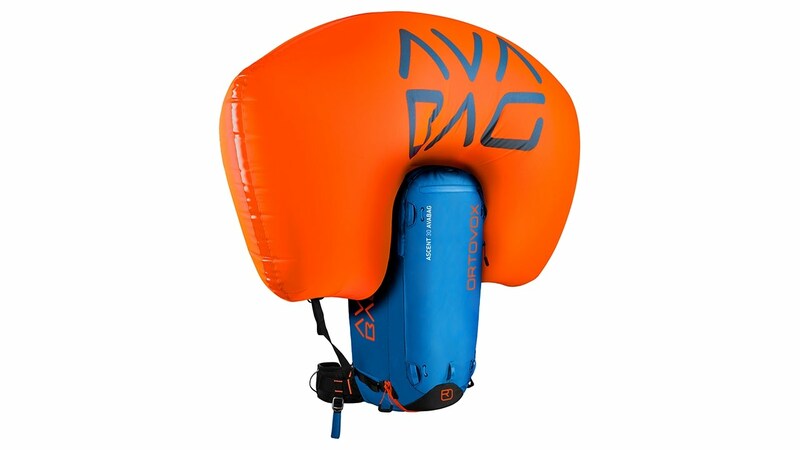 Including the AVABAG system (the airbag system developed by ORTOVOX) and cartridge, it weighs only 1640 grams.The light and sensationally compact airbag system weighs in at just 690 grams*. The ASCENT 22 AVABAG comes without an AVABAG unit.